This week has been a rough one for me. Saturday night I started feeling like I was getting the flu. Sunday came with severe stomach cramps. Monday continued with the cramps, but finally Tuesday the let up. I was still not feeling right until Thursday afternoon. Lucky for me, Thursday evening brought my neighbor requesting me accompany her at the gym! Total for the week: 6.42 Miles! 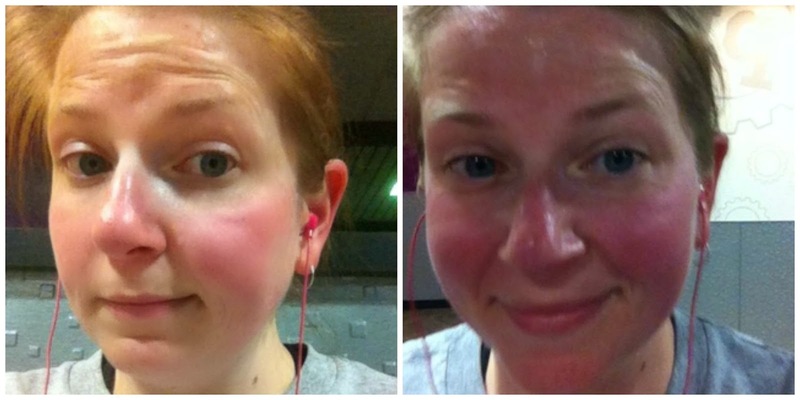 These pictures reflect me before and right at the 2 mile mark on my workout from Thursday. I am currently doing the c25k program. Thursday's run was the start of week 5. Running for 5 minutes straight, 3 times is a killer! I'm looking forward to Week 5 Day 2 tomorrow. I will be doing that workout outside, so I need to remember to force myself to keep going. Its much easier to keep up your pace on the treadmill! I am happy to see this loss, but I wish I it was higher. I stayed away from all foods that show an intolerance. However I may have eaten a little too much candy from Easter. I need to stay away from the sugar! UGH!!!! I got bloodwork results back from the doctor and it looks like my thyroid is going crazy again. I am hoping this is the main reason for my plateau with weightloss. It seems I gain and lose the same 5 pounds every month. So over that! I'll be going back in at the end of the month for new bloodwork and possibly a change in Rx. Someone pray for me! Track calories closely and be aware of what is going in my body. Stay away from all food intolerances. Stay away from SUGAR! !Have only 2 rest days.